I am proud of my alma mater and peer institutions for sponsoring this initiative. Details below. The IITs have taken up an initiative of starting online teaching and thus have started offering course materials online for every engineering stream. 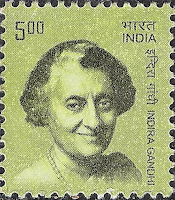 Many professors from all the IITs have provided course materials for each chapter and each subject. One has to register at the link provided below and can access the course material free of cost. Every Chapter has been described with diagrams and charts. Please spread this message to everyone, as many can benefit from this program taken up by the government and IIT. This is just a trial period going on and hence I request everyone to register at the link given. Please spread the word, so that this initiative benefits as many students as possible. Savouring Cabbage Pathrode at Woody's. On the left is what remained of green chilli bajji. So we bought junior his first bicycle today. 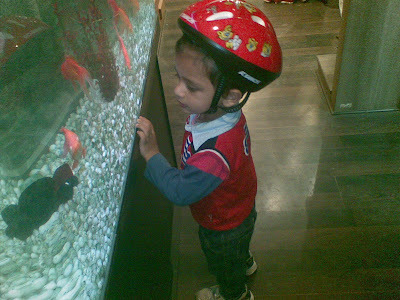 Alongwith came a red helmet. All was well till we put the bicycle in the car's boot. 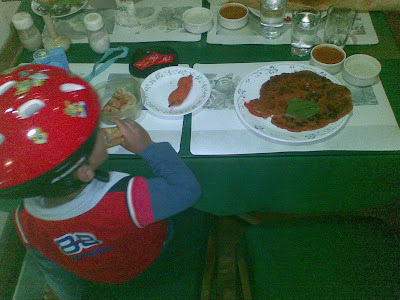 Then we realized that junior and his headgear weren't to be parted. For the rest of the evening we're shopping with helmet in tow (and junior underneath it). Sure makes it easy to spot him in crowded shops though. I had a fairly short learning curve with cellphones. Pretty soon I'd figured which websites would review the hottest cellphones and reveal yet to be launched ones. In fact some of my friends used to ask me for these URLs. I think Google search hadn't matured as much at that time (all the others like Altavista, Hotbot, Dogpile were still smoldering as they died down). 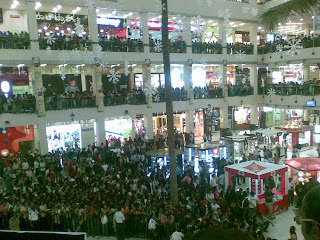 So, I came across this excitement about the launch of Sony Ericsson's first ever smartphone. The amazing P800. It had everything you could think of - and more. I was just wide eyed in wonder at all the stuff it could do. One of the biggest attractions to most people was the fact that it had a digital camera built in. Actually that was probably it's weakest point because it did pretty poor grainy images. However, that's what people were interested in the most. So I spent a princely sum to make the P800 my own (around INR 30k, about 750$, IIRC). Sometime in 2003. The P800 was the first Sony Ericsson-branded smartphone and was feature rich: built-in camera, a pen-operated touch-screen, media player, Web browser, organiser functions, PC synchronisation, GPRS, MMS, Bluetooth and Java. 3rd party apps had started appearing on handango. It had a great form factor as far as smartphones go. And it was curvy in a cute way. All subsequent models from Sony Ericsson went business like steel greyesque straightlined ones. I used it for a lot of stuff. I got GPRS enabled and even used to surf the web. And Yahoo IM though Agile Messenger was a commonly used app. I heavily used this till mid 2005. In between at one time the screen broke (I'd dropped it) and I had to give it for an expensive repair (cost about 200$). I still have this phone as a back-up and I'd last used this in 2009! Overall, I think this was a phone much ahead of it's time and I thoroughly enjoyed having it. Many phones I had since then were lot less impressive. The thing I like the most? The rotating jog dial on the left of the phone. This made it possible to scroll and click on this phone even with one hand. I just love this feature. I guess it's a SONY proprietary design (the j70 had it too) and I miss this on most other cellphones. Well, it was not just the battery problem with Siemens c35i alone. I confess that I wasn't immune to the social pressure of possessing a smart cellphone. I had also discovered the Burma Bazaar area while buying accessories for the c35i (besides the data cable, I'd also got car chargers, covers, cases, batteries, handsfree etc). On one of these trips I saw the pleasantly trilling metallic cellphone. On enquiry, I found this to be a SONY (which was unusual - there wasn't a SONY cellphone I'd seen before) and pretty well priced. I straightaway went in for that. It was sometime in 2002. It was not for long that I could resist the allure of a cellphone. I think I succumbed in the mid of February 2001. By then many more cellphone models had proliferated. And the rate plans had also become a bit easier on the wallet. After a decent amount of research (there wasn't really a whole lot of options still), I zeroed in on the c35i from Siemens. For it's day it was probably a fairly advanced model. And it was in the top half of the models sold in Bangalore (at that time). The more attractive aspect was the very curvaceous design. The buttons had a bluish green backlight. And it had many features. Pretty soon I discovered that a data cable would open up newer frontiers. Based on some colleagues input, I hunted out the Burma Bazaar in Gandhibazar area (near Tribhuvan cinema). And got myself a data cable. It used to plug into the serial port of the laptop. With this I tried a lot of things. Most notably ringtones and screensavers. Even though this model was fairly popular, most people had stock ringtones. So I used to bask in the glow of ringtones based on my favorite songs and guitar riffs. Folks started coming to me to get ringtones and graphics updated on their screens. When I think back, the earliest recollection I have of seeing a cellphone was in a TV commercial. In itself, it mayn't have been original. But on Indian television (satellite had started to challenge Doordarshan) this was a big hit. I remember seeing it umpteen times at Cricket match commercial breaks. Enjoy! The Nokia 5110 was the first cellphone I saw up front. I was fresh out of college in my first job. One day my manager met with a cellphone sales agent in the office and bought this phone. At that time, I think, cellphones were bought by appointment. One didn't just walk into the shop and buy one. It was a more elaborate transaction. 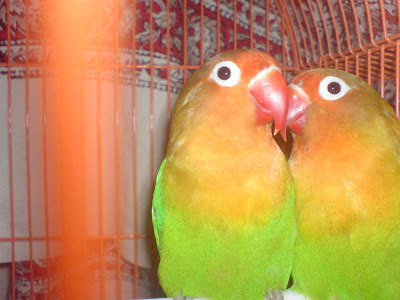 At that time in Bangalore, there were two main cellphone operators - Spice and JTM. And on all the billboards this one cellphone held pride of place. There were other models too, but this was by far the most popular. To a large extent because of (comparatively) attractive pricing. The call rates would burn through the turban of any raja. Both incoming and outgoing calls were charged. And at 5 to 10 times of present day rates. So it was common to see people with cellphones who wouldn't receive an incoming call. Rather, they'd call back from the nearest landphone. So it was more like a pager. Even text messages cost the moon. And only someone extravagant enough to have a cellphone would possess the means of originating a text message. Two other acquaintances that bought this cellphone around that time were my project lead at work and a roommate. Both were the cynosure of all eyes. It was very pleasing to be greeted by the above image when I opened the browser today. Thanks to Google, Rabindra Jayanti came alive on the web. Will be a decade since we graduated from good old KGP. It would be nice to make a trip back. I found Wired's take on Tokyo intriguing. The movie soundtrack on Youtube was more so. I came across this TV report on IBNlive which brought back many memories. It was when I was a schoolboy in Nagaland. An aging Naga gentleman had mentioned seeing Netaji's INA march through his village. On seeing my interest he had sat down and talked long about those days. Netaji had come in from Burma with the Japanese. His eyes took on a gleam as he talked animatedly about the march of the Japanese, their food, their equipment and their medicine. The last had amazed the villagers. Apparently the Japs had a lotion that cured cuts in no time at all. The villagers had benefited well from Netaji's march passing through. And he was definitely left in awe! Never too soon to start! At the Childrens Park Sandbox. And now, originally uploaded by stacktop. 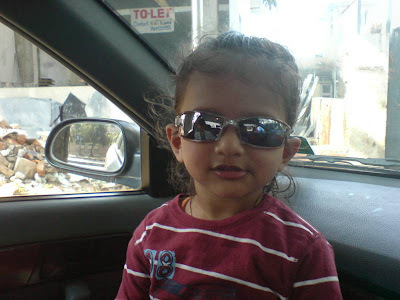 In the previous post I'd put a picture of Achintya with his Chotodadu when he was just a few months old. 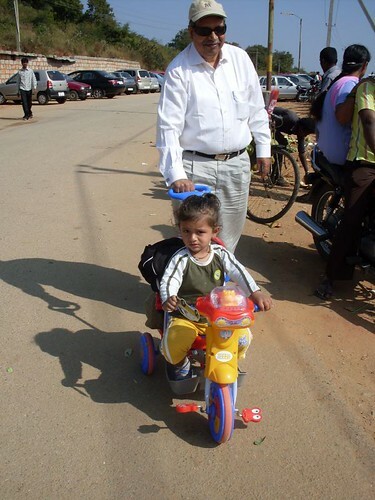 Here's a picture from 2008 Christmas day when we had all visited Innovative Film City (Chotodadu had just bought him the cycle he's riding on the previous evening). ChotoDadu, originally uploaded by stacktop. 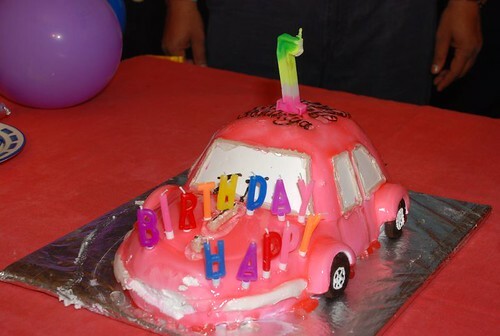 For his first birthday, Achintya had a cute cake shaped like a Volkswagen Beetle. That was from JustBake in Indiranagar. DSC H1 works again ! At the Sony showroom, originally uploaded by stacktop. Well well. 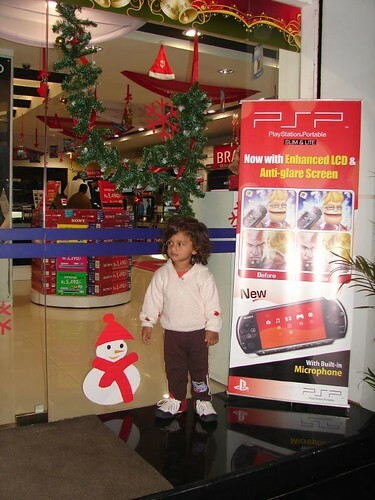 We then traipsed down to the Sony showroom on the ground floor. Got a pair of regular batteries and a MiniDV head cleaning cassette (this one cost a bomb - Rs 875!). And kept on taking pictures with the newly recovered camera. What a joy! 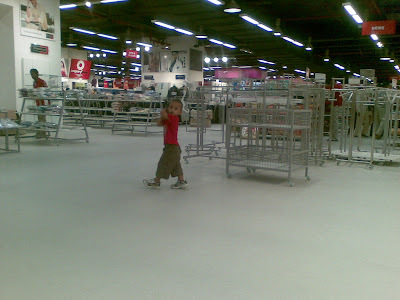 Achintya was thrilled with all the gadgets in the store and wanted to spend the evening dancing to VH1 songs playing on the LCD television's there. I had to haul him into the car actually kicking and screaming. Am planning to get better with the camera. Found a nice whitepaper. In 2000 I'd bought an Olympus Digital Camera. The impressively named Camedia D 360L, with all of 1.3 Megapixels and an 8 MB SSFDC card, cost me a good 350 bucks. Image transfer was via RS 232 serial cable, and I remember starting the transfer before sitting down to lunch and still having to wait for it to complete. Come to think of it, it was not that bad. I had extensively used it and some of the pictures are a pleasureable reminder of the bachelor days... Ahem, around 2004 the camera decided to go to Davy Jones Locker. I started badly missing it around end of 2005 and started looking at what I should buy. Based on a friends input (thanks Raju! 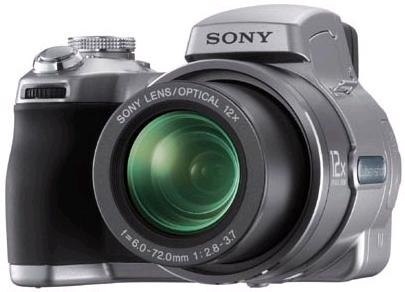 ), who'd also bought the same, I bought the then freshly launched Sony DSC H1 for around 400 bucks. This was such a pleasure. It was highly capable and was also very easy to use. We could just hand it to anyone and they'd click away in Auto Focus mode. We used it well for the first 2 years. And then in 2007, when our son was born, we just went overboard clicking away. I noticed that we'd clicked over 5000 pictures in the last 2 years. Well, all good things come to an end (I guess). The other day it stopped working. Boots to review mode, but when I put it into any of the shoot modes, it shuts down with a small noise near the lens. I am plannning to take it to the Sony Service Center. Let me see how it goes. Meanwhile, I've already started looking for probable replacements if this doesn't get fixed. So far the Sony DSC H50 and the Canon EOS 1000D have looked good. Everyone expects 2009 to be of unprecedented difficulty. And yet, I have received unprecedented amount of New Year Wishes (Some from friends whom I hadn't heard from in years - so quite nice actually, thanks!). Maybe this is not a contradiction really. Perhaps unprecedented challenges bring out that ultimate human ability - to hope. Here's wishing that all my friends get the strength to get through the difficult times ahead and emerge the better for it.